The NFIB Small Business Optimism Index for the month of September was reported at 107.9 and just slightly missed consensus expectations of 108.0 for the month. Also, the Index declined .9 points from the recording setting 108.8 reported in August. However, the September reading represents the third highest reading recorded in the 45-year history of the Small Business Optimism Index. In short small businesses remain optimistic about their operating environment. 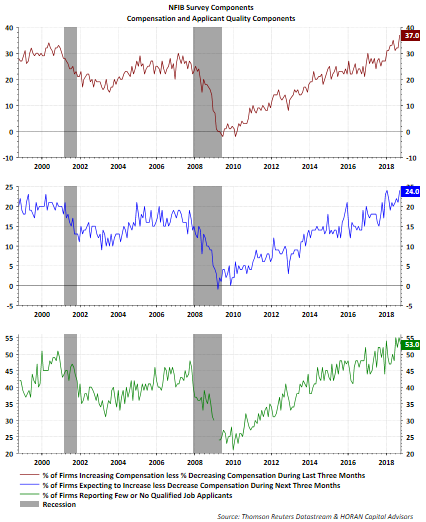 The below set of charts summarizes a few of the survey components around business conditions/sales. 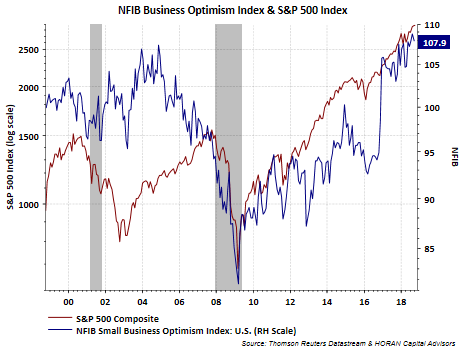 The top chart displays the outlook for general business conditions on a net percentage basis, that is, the line represents responses for the percentage of firms expecting better conditions less worse conditions. This component remains at a high positive level. The bottom two portions of the chart take a look at actual and expected sales. Actual sales over the last three months have been better than the earlier three month period. The bottom portion of the graph shows sales 'expectations' looking ahead three months and business are anticipate a higher sales environment as well. Rising interest rates have been a topic du jour, yet inflation reports have not been extreme. On the other hand, wage pressure may be percolating under the surface and the small business survey may provide some support for that point of view. The top section of the below chart shows an increasingly higher percentage of businesses have indicated they are raising compensation versus lowering. Also, the middle portion of the chart indicates businesses expect to raise compensation in the future. This lines up with the survey component noting a high percentage of firms are finding few or no qualified applicants for job openings in the bottom section. Firms seem to be saying they are paying up for qualified applicants as well as raising compensation in order to retain employees. 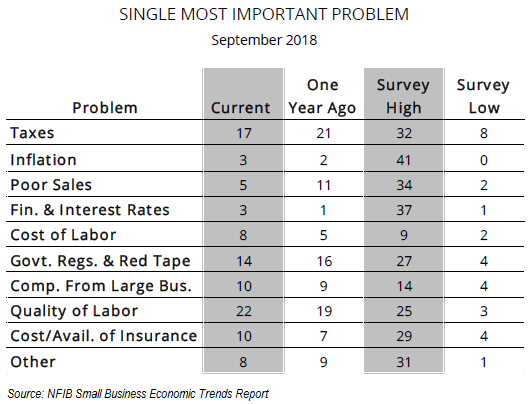 In summary, the below table outlines a number of the single most important problems facing businesses at the moment. Quality of labor and operating costs components are higher than a year ago and these may be indications of potentially higher costs that get passed through to the end consumer. By and large though, business optimism remains at a very high level and confirms the economy is operating at a high level.